Beginning in the late 16th century, many explorers tried and failed to be the first to find and navigate the fabled Northwest Passage. Their names are familiar to us now, identifying the features of the Canadian Arctic land and sea. Historical and popular accounts of their voyages into the cold, ice-laden waters of the Arctic are full of suffering, hardship, death, mutiny, vanishings and even cannibalism. The fate of one such explorer, Lord John Franklin, and his 1845 expedition team remained a mystery for more than 10 years. Lord Franklin with his seamen does dwell." Verse from "Lord Franklin" an English Ballad. In spite of being one of the best equipped expeditions and carrying five years of food supplies, Franklin and 128 members of his crew perished in the Arctic. The sea ice surrounding King William Island didn't melt enough in the summer of 1847, keeping Franklin's ships trapped through the following winter. Franklin died on June 11, 1847. In the spring of 1848 the remaining 105 members of the expedition abandoned their ships, camped on the island and eventually perished. The search for Franklin and the Northwest Passage contributed to the mapping and exploration of Canadian Arctic waterways and the identification of several possible Passage routes. Nearly fifty years later, Roald Amundsen, who later beat Scott to the South Pole, became the first to navigate the Northwest Passage sea-to-sea in 1903-1906. It took Amundsen two years to pick his way through the ice-laden waters of the Arctic. Like Franklin and others before him, his ships often became trapped in the sea ice for long periods of time. In the absence of the sea ice, navigating the Passage would be quick and easy. If the record-setting melt of Arctic sea ice in 2007 in any indication of things to come, ships sailing in open water through the Northwest Passage could soon become a daily, year round event. Sea ice forms when a frigid air mass above the sea surface chills the surface seawater to its freezing point. It starts out as single ice crystals. The ice crystals bunch together into clusters called frazil or grease ice. Eventually the clusters begin to freeze together forming a thin continuous sheet (nilas). The sheet gets thicker as additional ice forms at the edges and on the underside of the nilas. Wind and waves force the nilas together to form bigger sheets that float on the surface (pancake ice). There are differences in the accumulation and distribution of sea ice in Earth's Northern and Southern polar regions. Accumulation and distribution are controlled by the differences in the influx of solar radiation due to the tilt of the Earth's rotational axis, distribution of land masses, distribution, temperature and circulation of water masses and atmospheric and oceanic seasonal characteristics. The extent of sea ice varies greatly with the seasons. When it's winter in Arctic, it's summer in the Antarctic. Arctic sea ice reaches its maximum extent (~14 million square kilometers) in March, melts to its minimal extent (~7 million square kilometers) in September and has an average thickness of ~3 meters. Antarctic sea ice reaches its maximum extent (~20 million square kilometers) in September and melts to its minimum extent (~4 million square kilometers) in February. The amount of sea ice lost in Southern regions during the summer melt (~16 million square kilometers) is about equal to the land area of South American. Arctic sea ice is generally older and thicker than that in the Antarctic. Prior to the late 1970's the information about the extents and concentrations of sea ice in our polar regions came from visual observations by ship and aircarft crews, explorers and researchers and native peoples. Since then, remote sensing through the development and deployment of satellites equipped with passive microwave radiometers has provided data to produce detailed polar images for identifying and tracking sea ice extents, concentrations and floes. Analyses of sea ice extent data (satellite since 1978) included in the International Government Panel on Climate Change (IPCC) Climate Change 2007 Synthesis Report indicate that sea ice extent is shrinking: North polar sea ice at a rate of decrease of ~3% per decade; South polar sea ice at rate of little more than 1% per decade. How fast and far-reaching the implications of the changes in sea ice will be is still open to some debate. But according to the IPCC Fourth Assessment Summary Report, climate models indicate that sea ice extent is projected to continue to shrink in both the Arctic and Antarctic. Some projections indicate that Arctic sea ice could disappear entirely by the end of this century. Satellite and pre-satellite records indicate that the Arctic has not been been free of summer ice for at least 5,000 and possibly 125,000 years. Earth's climate system and ecosystem did not develop in conjunction with an ice-free Arctic. An ice-free summertime Arctic could have significant and unforeseen ramifications for climate change and ecosystems. Recent changes in the extent of summer Arctic sea ice could suggest that the long sought-after Northwest Passage will become accessible for long periods of time in the future. In September of 2007, the Northwest Passage was reported to be totally free of ice for first time since satellite monitoring began. Commenting on the unexpected opening of the Passage, Mark Serrenze, a senior scientist at the National Snow and Ice Data Center (NSIDC) in Boulder, Colorado said: "We're probably 30 years ahead of schedule in terms of the loss of the Arctic sea ice.". In October of 2007, the National Snow and Ice Data Center (NSIDC) reported that recent satellite data indicated that Arctic sea ice extent reached the lowest level (4.28 million square kilometers) recorded since satellite monitoring began in 1979. The new record was 23% lower than the previous record set in 2005 and 39% percent lower than the long-term September average for 1979-2000. Because of your interest in sea ice and your knowledge of the interaction of the Earth's spheres, the National Snow and Ice Data Center (NSIDC) has asked your team of interns to examine Arctic sea ice data records and other resources to learn as much as you can about the implications of the September 2007 record-setting event. The NSIDC is particularly interested in your conclusions about what the possible causes and impacts of the 2007 event on Earth's spheres indicate about future trends in sea ice extent and concentration and climate change. Map showing Roald Amundesens' 1903-1906 Northwest Passage route. It took Amundsen nearly two years to be the first to navigate sea-to-sea. Image credit: National Snow and Ice Data Center, Courtesy of University of Bremen. Full story. Northwest Passage: The purple line marks the route of the Northwest Passage that opened up in 2007. Image credit: National Snow and Ice Data Center Image, courtesy University of Bremen. New York Times article. This data visualization from the AMSR-E instrument on the Aqua satellite show the maximum sea ice extent for 2008-09, which occurred on Feb. 28, 2009. Credit: NASA Goddard's Scientific Visualization Studio. During the winter, winds and currents push some of the thick, multi-year ice out of the Arctic Ocean. In the past, that thicker ice was replenished by new ice that survived several summer melt seasons. Credit: Chuck Fowler and Jim Maslanik, University of Colorado, and NSIDC. View animation. This figure illustrates the extent to which Arctic sea ice is melting faster than projected by computer models. The dotted line represents the average rate of melting indicated by computer models, with the blue area indicating the spread among the different models (shown as plus/minus one standard deviation). The red line shows the actual rate of Arctic ice loss based on observations. The observations have been particularly accurate since 1979 because of new satellite technology. Image Credit: Steve Deyo, UCAR, based on research by NSIDC and NCAR. Full story. An introduction to sea ice: what it is, how it forms, how it is studied, how it affected historical expeditions in the polar regions, and what role it plays in the global climate. The site contains over 80 pages of information on sea ice, including a glossary of sea ice terms and links to more information. Be sure to access the State of the Cyrosphere pages for details and data about what sea ice is telling us about climate change. National Snow and Ice Data Center. NASA Earth Science Enterprise-funded project: use of satellite data in high school and college science classrooms by developing classroom materials linked to guided inquiry computer exercises. This Polar Sea Ice Processes module is one of four Studying Earth's Environment from Space (SEES) modules. 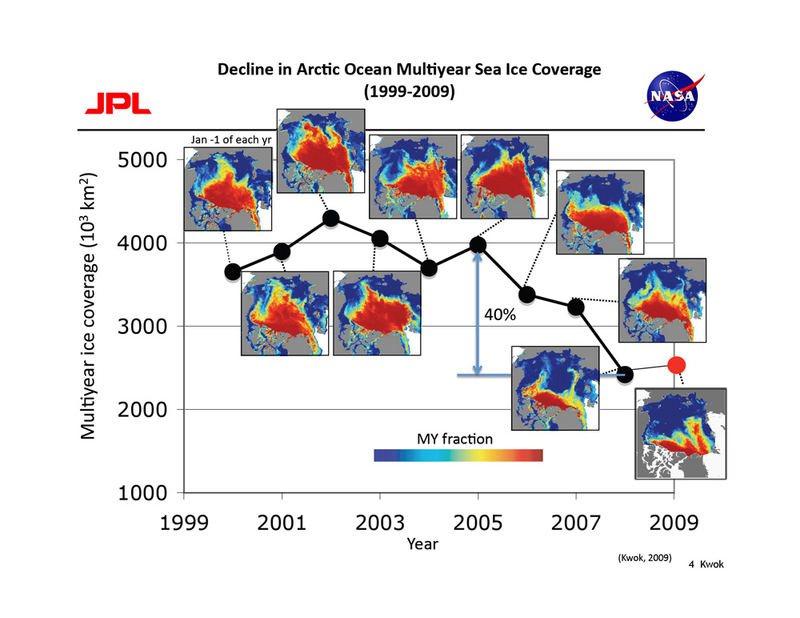 From August 10, 2007, through the end of the summer melt season, NSIDC posted updates on Arctic sea ice conditions. The goal of the Arctic Climate Impact Assessment (ACIA) is to evaluate and synthesize knowledge on climate variability, climate change, and increased ultraviolet radiation and their consequences. The aim is to provide useful and reliable information to the governments, organizations and peoples of the Arctic on policy options to meet such changes. Comprehensive online reports. Use the online indexes to access topics of interest or download the complete reports. The following provide insights and additional information about sea ice conditions and changes and implications. Cysrosphere Today Data and much more. The Compare Daily Arctic Sea Ice Extent tool is easy to use. Compare side-by-side images of Northern Hemisphere sea ice extent for any two dates in the satellite record (1979-present). Sea Ice Index Average ice conditions estimated using satellite passive microwave data for the most recent month available, as well as snapshots of trends and anomalies that compare these recent conditions with the mean for the month. High School level and above. Sea Ice Index Animation Tool Search and view extent and concentration animations by year. Or use the Sea Extent Trend graphing tool (on the right) to access and view graphs of sea ice anomolies 1979-current. Scientific Visualization Studio - Sea Ice Animations Looking for sea ice animations? Goddard Space Space Flight Center. Watch and listen as Mark C. Serrese from the National Snow and Ice Data Center shares his thinking about the causes, impacts and implications of the 2007 Arctic sea ice event. Includes an interactive index. Presented at the 2007 AGU Fall Meeting. Peruse an archive of map displays of the atmospheric and radiative climatic conditions leading up to the record setting Northern Hemisphere sea ice minimum of 2007. Read timely scientific analysis year-round. NSIDC provides an update during the first week of each month, or more frequently as conditions warrant. Search the archived issues for specific times of interest. The following resources provide insights and information about sea ice related issues. Arctic Sea Ice Now and in the Future Tipping Points: The Arctic and Global Change. Julienne Stroeve, National Snow and Ice Data Center ARCUS 20th Annual Meeting and Artc Forum pdf. Uncertainty in Climate Model Projections of Arctic Sea Ice Decline: An Evaluation Relevant to Polar Bears. USGS Science Strategy to Support U.S. Fish and Wildlife Service Polar Bear Listing Decision pdf. Increasing Antarctic sea ice extent linked to the ozone hole. Increased growth in Antarctic sea ice during the past 30 years is a result of changing weather patterns caused by the ozone hole according to new research published this week (Thurs 23 April 2009). British Antarctic Survey Press Release. Winds, ice motion root cause of decline in sea ice, not warmer temperatures University of Washington News article summarizing results presented at the American Geophysical Union 2004 Fall Meeting. Link to full papers provided. The Arctic Oscillation and its Influence on Sea Ice and Polar Precipitation Abstract of paper presented at American Geophysical Union Fall 2008 Meeting. 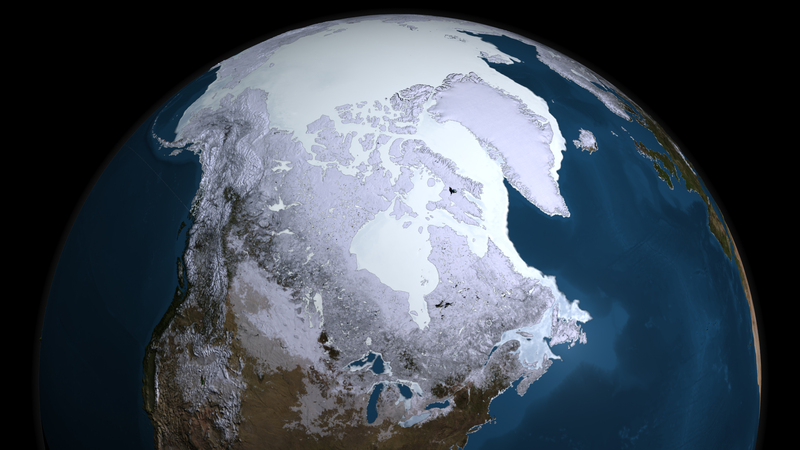 This guide provides instructions for educators on how to use sea ice data in the classroom. The data, from the National Snow and Ice Data Center (NSIDC), describe sea ice concentration and extent of coverage. Scientists use it to monitor changes in the concentration and coverage of ice in polar regions and to compare changes over time, such as loss of extent. designing a pedagogical structure that helps educators use imaging data in a manner that supports attainment of specific national education standards for middle school education. This guide provides information concerning climate change, the use of climate proxies and much more. The goal of the Simplified Image Management and Processing Learning Environment for Science (SIMPLE Science) project is to help overcome barriers to use of image processing and analysis (IPA) in K-12 classrooms. Includes a variety of interactive lessons that use WebImage a customized version of ImageJ. The Snow and Ice lessons investigate snow and sea ice extents using a prepared set of images. Note: processed sets do not include data after 2005. From the menu select Lesson Topics ->Earth Science and then Snow and Ice I. More advanced learners can learn to use ImageJ by completing the Wither Ice investigation in Cycle C.
The National Snow and Ice Data Center (NSIDC) has made a select set of images viewable through the popular interactive desktop application, Google Earth. Users can choose from a set of data-based images (KMZ and KML files) and display them on a virtual globe. More advanced learners: use the dataset, imaging, and animation resources listed in cycle A to create your own animations and graphs for analysis. MY NASA DATA investigation using NASA satellite data to study changes in temperature and snow-ice coverage in the South Beaufort Sea, Alaska, correlate with USGS ground tracking of polar bears, and relate this to global change, sea ice changes, and polar bear migration. Grades 7-10. This investigation is one in a series exploring the history, biology, and ecology of the National Marine Sanctuaries. It was developed for National Geographic's Oceans for Life program, in collaboration with and with support from the National Oceanic and Atmospheric Administration. For grades 6-8. In this exercise students use Google Earth and information from several web sites to investigate some of the consequences of climate change in polar regions, including the seasonal and longer-term changes in the extent of the ice cap at the North Pole, disintegration of ice shelves, opening of shipping routes, access to sources of fossil fuels, geopolitics, effects on polar bears, and possible secondary effects on climate in other regions due to changes in ocean currents. MY NASA DATA investigation of how snow and ice cover have changed on the Earth from 1994 to 2004, and to practice using some of the data analysis tools available at My NASA Data. Grades 9-12. Advanced learners: locate and analyze additional 2004-2009 data. Download images from the National Snow and Ice Data Center (NSIDC) and animate them to see how sea ice in the Arctic has changed over the last 30 years. Use ImageJ image processing software to measure the ice extent during November of each year. Import the measurements into a spreadsheet application to produce a graph, and compare them to air temperatures in the region. Require 5-7 (45 minute) class periods. Grades 6 and up. Advanced learners: complete the Going Further investigations once the tools have been mastered or prepare image stacks and spreadsheet analeses for other Arctic regions that support polar bear populations.